In the scorching heat of this summer, we love to indulge in ice cream to cool us. One ice cream that can satisfy our cravings and delight is the new Selecta Hershey’s Ice Cream Collection. It has the fusion of our favorite chocolate flavors. Dig into smooth Hershey’s chocolatey goodness combined with the rich, velvety texture of delectable Selecta ice cream available in Selecta Hershey’s Milk Chocolate, Milk Chocolate with Almonds, Reese’s Peanut Butter Cups, and Kisses flavors. And since Selecta and Hershey’s use only the best and finest ingredients, you’re assured of pure happiness with every scoop. Selecta ice cream's texture is very smooth and creamy. You get the best of two best worlds. The experience that comes with enjoying a cup of sweet, creamy ice cream is beyond words. 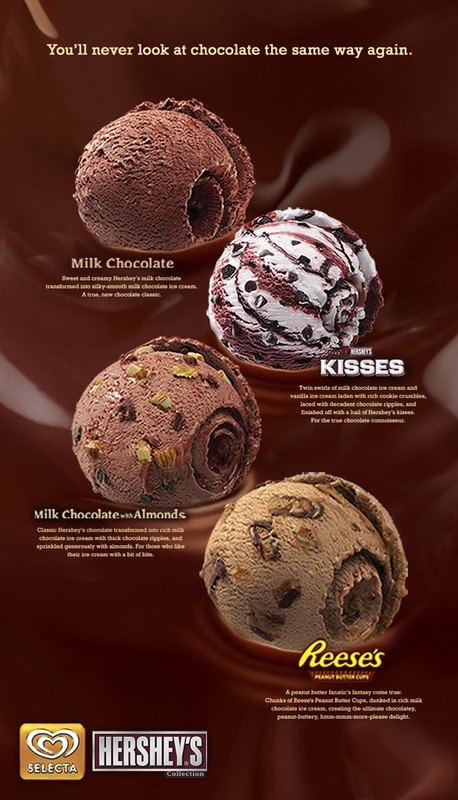 Selecta and Hershey’s are all about happiness with every scoop. Whether it’s summer or not, new Selecta Hershey’s Ice Cream Collection is best to share with the family, a group study with friends, on a romantic date with your special someone, or when traveling or having a road trip with friends. Delight in the fusion of sheer chocolate bliss and supreme ice cream satisfaction. 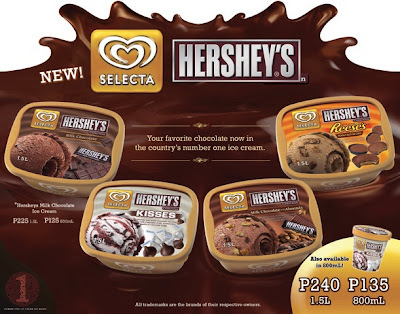 Grab the new Selecta Hershey’s Ice Cream Collection today. Available in 800mL and 1.5L packs in any supermarket, grocery or convenience store nationwide.